Born Nakina Oct 37, left about age 10/12 (not sure). Father owned the Bakery & rooming house. Recently had an email from Joyce Borsa. Know lots of those there in the 40s! And none of them mentioned me!! This is the suitable blog for anybody who needs to find out about this topic. You understand so much its almost exhausting to argue with you (not that I actually would need…HaHa). You undoubtedly put a new spin on a subject thats been written about for years. Nice stuff, simply nice! There are actually certainly a good deal of details like that to take into consideration. That’s a great point to bring up. I offer the thoughts above as general inspiration but clearly you will find questions like the 1 you bring up where one of the most significant thing will be operating in honest superior faith. I don?t know if best practices have emerged around items like that, but I am certain that your job is clearly identified as a fair game. Both boys and girls feel the impact of just a moment’s pleasure, for the rest of their lives. Usted no tiene que pagar los costes de traslado ya que éstos no son un servicio que le ofrecemos, sino que son una OBLIGACIÓN que asumimos y cumplimos con vigor para su bienestar y el de su familia con nuestro servicio tecnico. Las lavadoras lavarropa es un aparato eléctrico, que puede ser también electrodoméstico de uso industrial, usado generalmente para lavar ropa. Las lavadoras tienen en su puerta un sensor un bloqueo automático, que cuando se abre detiene el funcionamiento, que impide que puedan ser abiertas mientras están en funcionamiento. Nuestro servicio técnico de lavadoras Philips, están disponibles de lunes a viernes de 9 a 20h y sábado de 9 a 2h en la reparación de electrodomésticos. Please stop writing nonsense on this board. This board is for people who are interested in connecting with family and friends from Nakina. Whatever it is you’re selling sell it elsewhere. It is awesome you gotta come to nakina!!! Me, my husband Raimo and daughter Rita lived in Nakina 1969-1972. At the time there were sewen other finnish familys, men working for Kimberly Clarc. I remember Doris Tees and Lindemans, Maki family. Hotte was my daughter’s teacher, Dorothy and Jon Hakala our neighbours. I visited Nakina 2010 an hope to go back some day. I grew up from age 3 to 13 in Nakina. My father Stewart McLrod was a fireman and then a loco engineer.I remember swimming in Codingly Lake skating in the rink and the pot belly stove in the rink shack. Also many hours of picking blueberries and fishing off the bridge at Twin Lakes. My best friend was Betty Ann Broad and I remember her sisters Joyce and Lois and Bobby. Mr Weiss owned the drugstore and had 2 sons Barry and Bradley. We lived on the hill across from the tracks and next door to Gunns. Dougie Gunn taught me to ride a 2 wheeler. Every Sat we would usually go to Aubreys Theatre. What wonderful childhood memories. I remember going to the Kiwanis Music Festival and singing in the choir from the school. It was a big trip to go to Geraldton.I also remember Ivor and Edie Lassie and babysitting their 3 girls Diane Barbara and Charlotte. My brother Max McLeod was good friends with Billey Kibsey, Pud Hatchard and Alvin Hawkinson. Many friends come to mind and have lost track many years ago bout still think I had such a wonderful childhood growing up in Northern Ont in the bush. Back then only way in was rail and we did get some planes landing at Cordingly Lake.our Dr. Was Dr. Mccillop. I spent my young childhood years in Nakina. My Father Stewart McLeod was a fireman and loco engineer. I recall a wonderful childhood Cordingly Lake and skating in the old outdoor rink. My best friend was Betty Ann Broad and I remember her little brother Bobby. Mr weiss owned the drugstore and their sons were Barry and Bradley what fun we all hadwe moved the end of of 1952 to Hornepayne. My family moved to Nakina back in 1966 when I was only 2 years old. My father worked for the CN until he was transferred out 10 years later. Our family moved to Barrie, Ontario where my parents still live. Nakina was a great place if you were a kid growing up. Beautiful hot summers (even though they were too short), and long cold winters. I can still remember biking out to Cordingly Lake. As a child I loved it all. This tiny little town holds a special place in my heart as it was our family’s first home when we moved to Canada. I will never forget the people, the scenery and the peacefulness of this little town. Hope to get back sometime and relive those childhood memories. My name is Susan Scott. We lived in the house at the top of the hill in the picture posted as you arrive in town. Mom passed away several years ago , however dad is 94!! Lives in Oakville near me in an assisted living home. He still talks about nakina! Sheryl ,Ken myself and my late brother Murray Scott were all delivered by dr. Mckillop. Driving into town in the back of dad’s truck to return pop bottles and then buy penny candy at the Kena grocery store. My sister lives in Thunder Bay, me in Oakville, Ken in St. Catharines . Dad worked for the CNR and then lands and forests. Still remember the old outdoor skating rink! Also the Hudson’s bay store we we could walk in and put groceries on a tab. My parents, Henry Duquette and Madeline Simon were married in Nakina in 1935. Sister Laurette and I were born there. 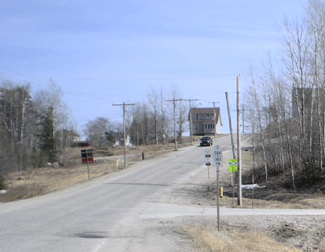 We moved to Kitigan in 1939 and eventually to Kapuskasing in 1952. However, I did return to Nakina, once in July 2012 with sister Lucille and son Barry and again in 2013 with sister Laurette and son Barry. Both times we spent time at the CN train station for a lunch and thought about the place where the family left when I was just a year old — and both times we spent time at the cemetery where Grandfather Romeo Simon is buried. Oh yes, loved the CNR-Rail-Museum by the train station. I noticed an error on my first blog. The youngest,Claire,was born Dec. 1933. As I read the blogs I see many familiar names-either I remember them or I heard my parents talk about them. They had many friends in Nakina. My parents moved to Nakina when they were married in 1928. Dad was a locomotive engineer. The four of us were born in Nakina from Jan.1930 to Dec 1931. Dr. McKillop was the doctor. My parents friends were the Downey Families,the Dunns, the Aubrey’s, and the Dr. McKillops. In 1936 Dad was taken off the mainline because he was colour blind. The following year we moved to Hornepayne where Dad was fireman on the yard engine. I remember well the rivalry when the baseball teams and hockey teams came to Hornepayne from Nakina. I remember the Gibsey sisters. Some may remember my brother,John. He was in Nakina installing telecommunications. He died in January of this year. I have photos of Hilding (Alvin’s father) as a young man, as well as Hilding’s family in Sweden. My grandfather was Hilding’s older brother Edwin. Lived in Nakina from 1950 to 1960 and would like to receive information about some of my childhood friends. Does anyone have any information about Jimmy Murphy, Sharon Murphy, Tommy Mcue(sp), Karen Mar, Thompson brothers, Bates sisters, Robert Mitchell, Sonia Duonivitch, the Redgrift brothers. There are many more but I can’t remember their names. I missed the 90th last year but hope to visit in 2015. Many thanks Ryan. We haven’t got back there yet this summer but will before the snow flies. Yes- please tell your Dad I said hello and I hope he’s well. I would love to get together with him and reminisce (sp) about the good old days. Two old farts and a pot of coffee! Thanks again. Take care. I was born in Nakina in 1945. my name is Helen Wareham, father Howard (nickname Dewey) mother Olga, brother Howie. Dad was a conductor on the CN, we moved in 1956 to Toronto when dad finally was able to transfer as he had enough seniority. We lived beside the Marr family, across the street from the Nadon and Hakala family. My uncle Walter Krystolovich lived there as well and my grandparents also. Peter and Helena Krystolovich, my grandmother owned a restaurant on the street where the railway station is. it was called Christie’s….they moved to Toronto in 1951. Grandma was also a seamstress My godparents were Elmer and Lilian Ruddick. Warrens owned the butcher shop.I have fond memories growing up there. I only went back once 1958 or 59. I was a teenager and had become very citified….I remember sitting in the Molly’s ? restaurant and a native woman came in and was breast feeding her child….I was horrified…too funny now. I remember the old Hudson Bay store where the natives came in and did their trading….sitting around the store or outside. 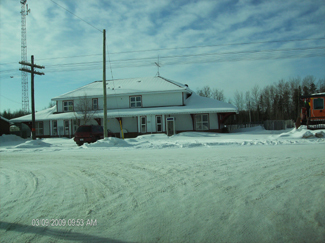 I was brought to this site because I was looking for a photo of the Nakina hospital where I was born and Dr. McKillop was our doctor. other names come to mind…Luxton, Halli. The principal at the school was Chochla…he wrote me several years ago and sent some photos of that time I was in school. Wow what a trip down memory lane. Not sure if many people still read this blog but I’m trying to dig up some info about my great-grandfather James Cordingley of who the lake is named after. He worked as the general manager at the train station during the 20′s and 30′s. Any info would be greatly appreciated. I lived in nakina in the early 70′s. my father John was a school teacher and my mother Maria was the town nurse. 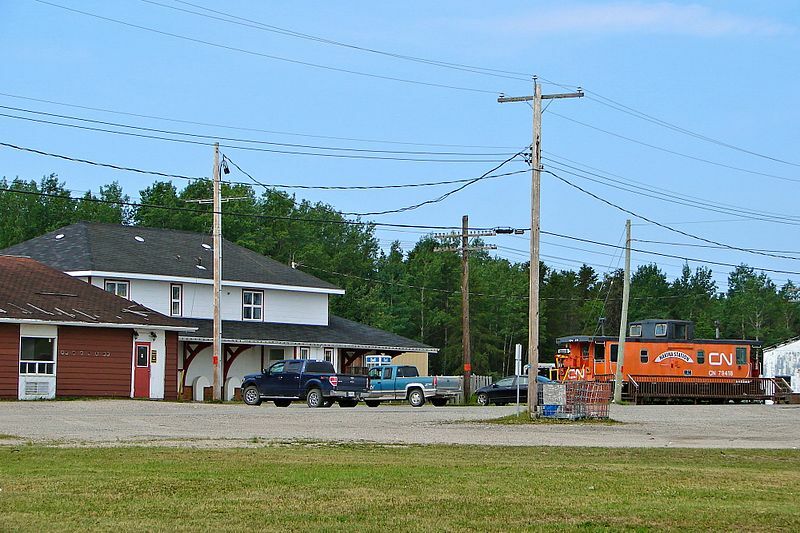 she ran the clinic out of the house beside the railway lines across from the restaurant. i have vivid memories of living there. my favourite ones are of going to cordingly lake in the summer, picking blueberries climbing trees, and of course sunday night at the dump to see the bears. to this day i still find it hard to pay for blueberries. i remember playing with my friend Deanna Pederson, her parents Eno and Helmi ran the fly out fishing tourism at twin lakes. good times. I stumbled unto your Nakina comment on this blog. Eino Peterson was my dad’s first cousin. Eino’s family Minnesota for Canada in about 1926. Reading about a relative in print (Deanna and her parents) stimulates the desire to be better acquainted. Whom ever the author of this Nakina story…..They should get the facts staite…. Below the first picture para 2….it stats….The 1940s saw Nakina get a radar base. Built in World War Two, the base was designed to protect the important locks between Lakes Huron and Superior at Sault Ste. Marie. Like many of Canada’s old radar bases, it was operated by the United States, but dismantled soon after the Second World War. Not true….Nakina never did have a radar base….It did have a Low Frequency radio range and an air strip. The purpose of which was to provide an air navigation system and emergency landing strips for aircraft transiting from the east to the west coast carrying cargo in support of the war effort, (WW2). It was not dismantled in the or decomission after the war, in fact I was station to Nakina in 1960 by Transport Canada as a radio operator/ weather observer. I’m not sure when the federal government shut down this station but am aware that it carried on for a good part of the sixties and was then taken over by I believe the Province as a lands and forests base. I suspect that who ever wrote this history may have been confused with perhaps the Pagwa River radar base which was collocated with another Low frequency radio range about 60 miles down the track from Nakina. This radar site was one of the many radar sites on the Pine tree Line and formed part of the early radar warning system that was established in the early part of the cold war…The Pagwa river site was operated by the U.S. Force 913th squadron and later by the Canadian Airforce. Dale: You are correct about the Department Of Transport air strip and radio/weather tower being operated into the 60′s and the entire property was turned over to the Township of Nakina in the early 70′s. There was in fact a radar base located on a rock outcrop south of the rail line and just west of the town water supply which we called the pump house. It would have been less than a kilometer from the CNR station which would have had a restaurant in it when you were here. The base was operated by the Americans and was only there for a few years during the 40″s. There are a couple of large pieces of concrete still there. As a youngster I remember climbing the rock pile close to the pump house with my pals and I was always told that it was the site of a WW 2 radar station. My family and I lived very briefly in Nakina between 1978 and 1980. My father was OPP and was stationed there to patrol Nakina and the surrounding areas. I don’t remember very much as I was only 3 or 4 but I do remember sledding around one of the schools. I am currently writing a paper on my early history and have enjoyed doing a little history search on Nakina; if anyone has information they would like to share in and around that timeline, it would be much appreciated! Leonard: Sadly, Glen passed away a few years ago. and you’ll find yourself on Keefer St in Nakina. Another way to move is to move the little orange man icon (in the window on the right) to whatever location on the map you want (so long as it’s coloured blue). I’ve never been to Nakina but I’ve been perusing the web looking for info on Nakina because I’m thinking of buying a house and retiring in Northern Ontario (from Southern Ontario). I was born in Nakina in a 2 room Red Cross hospital in 1953. Dr. Mckillop delivered myself, my brother and sister. My grandfather Roy Broad was a locomotive engineer, and my father Larry Wayne worked in the train station. he met and married my mother Joyce Broad in Nakina. My parents often talked about their life in Nakina. We left the area when I was 5 as my dad transferred with CN to southern Ontario. I’ve enjoyed reading these comments and must go and see this little town that was my birthplace. I too was born in Nakina. At home. The house beside the railway station that no longer exists. 1956. Dr. McKillip delivered me into the world. I’ve read the comments here and it comes as no surprise how this little place in the middle of nowhere enchants us all. As a youngster I remember climbing the rock pile close to the pump house with my pals and I was always told that it was the site of a WW 2 radar station. I remember the Broad family ( Bobby Broad ?) and my sister was born in the Nakina Hospital (Dr. Mckillop). I would like to firm up my recollection of family names 1945 – 1955 with anyone’s help. Bobby broad is my uncle. He lives in Vancouver BC. He has talked very fondly of growing up in Nakina.you must also remember his little sister Wendy, also my aunt. my grandfather and grandmother and their 3 children lived in nakina. my father was born there. their last name was janoff. my grandfather Evan, worked on the railway and my father Alex, left when he was 16 for a job in montreal on the railway. i would love to learn more about this town and the heritage. I lived as a child with my family in Nakina from 1955-1962. My grandparents, the Hietanens, lived down the street from us. We lived on the corner of First and Quebec(?) St. The Aubrey’s lived next door. My father Toivo Hietanen, worked for the CN railway back in those days. Still remember going to Corningly Lake to have picnics and picking wild blueberries and strawberries. Your father was a friend of my dad, Einar Wahl. living in Nakina was awsome! Leuninbergers had a fisheries operation out of their garage packing trout in crates. The dad gave a baby sturgeon to us which we took to school in a wash tub for show and tell! Toby and I used to go around trading comic books! We would collect pop bottles and egg cartons and bring to the Obries store for candy! Those were the days my friends! My Uncle Mikey Brown was an engineer on the Cn trains and lived in Nakina many years on Quebec St. I attendend public school in the last half of gr 6 1962. Skated at the outdoor rink. Went to Warrens grocery store and was introduced to the Beatles on the jukbox at Dollys resturant /drugstore. Went out to the Lake many times and enjoyed the steam baths at Cy’s. Have always wanted to go back.Very fond memories. Born in Chapleau while family was just moving to Nakina. Spent my first 4.5 yrs there. My memories go back to being 2 or 3 there. My Mom was a nurse, my dad was the principal of the catholic public school, his first teaching gig. I do remember a fair bit of the town and the people. I recall spending a lot of time on the lake going to the water slide, buying bottle caps at the canteen. I remember my dad building our house next to the airport. I am 41 now, but some day I would like to take the train there and stay for a few days. Great place for the formative years. Lived in Nakina from 1952 – 1962. Absolutely loved it. I remember Mrs. Bates, my first grade teacher. Visited with her several years ago on Vancouver Island. Was back to Nakina a couple of years ago. Cordingly Lake still has the charm (and blackflies) that it did in the 50′s. Mrs. Bates was also my first grade teacher in 1950 ? Her husband was the Manager of the Hudson Bay store. I recall natives still trading furs at that time. I have lived here for many years. Just want to pass along that Nakina is celebrating its 90th anniversary. If you are thinking of visiting us this summer, pick the long weekend in August 2,3,4,5. We have a committee who are busily organising events for that weekend. It will be a fun time for all. There is a site on Facebook as well as a separate site for the anniversary itself. There is a craft agenda in place right now. Saturday evening will have 2live bands, the Hot Rods and the Hoolies. Look us up and Come see and be seen-2013 in NAKINA. My father was Sid Rutherford who was principal of the Public School from Sept.1939 to June 1945. I was born there but spent most of my growing up years in southern ont. Returned in 1973 for the 50th reunion and never missed a summer vacation spent at our camp on Lower Twin. Bob and I retired in 2000 from GM Oshawa and bought the Vanderbeck farm on the edge of town. This year on the long weekend in August Nakina will be celebrating their 90th. We both living here in the north.